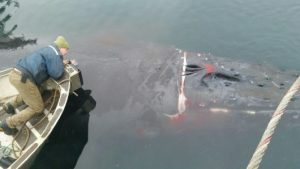 A group of Ketchikan good Samaritans banded together last week to help a humpback whale that had become tangled in a barge anchor cable off Prince of Wales Island. Oscar Hopps of Alaska Commercial Divers says the whale was discovered by Olson Marine crew members on Wednesday, January 4. The whale must have spun, Hopps said, because the cable wrapped around the top half of its head. Hopps estimates the whale had been tangled for a few days before it was discovered. Rescuers initially thought someone would have to dive down to remove the cable from the anchor, but Hopps said they were able to use the cable to slowly coax the whale to the surface, next to the dive boat. Hopps said the whale suffered minor wounds – the cable luckily missed its eyes – and seemed pretty tired after the ordeal. Hopps said the whale seemed to understand that the crews were there to help. National Oceanic and Atmospheric Administration officials are aware of the rescue, and have asked for photographs of the whale so they can identify it. According to the NOAA Fisheries website, entanglements are one of the leading causes of whale deaths. The agency has even produced a podcast giving tips on how to disentangle a whale – along with warnings about the potential danger of getting close to such a large animal.